Here it is! It arrived, the New Year, 2013! I am not really big on resolutions and big life changes starting January 1st (if I want to change something, I usually jump right into it. My problem is, I can't always continue), so I'm not going to start now. That said, I am going to promise here in writing, so I don't forget and don't stop half way, to put more structure into Pipidinko's daily routine, involve him in the everyday things instead of doing stuff like cleaning when he is asleep. I understand that he learns through play, so I am also planning to provide him with more meaningful playtime and activities, not just trucks and dinosaurs. He shows a lot of interest in new games and will try anything at least once, so as of now I will do my best and will try to incorporate these activities in the routine, to come back to them on a regular basis. Enough with the resolutions. 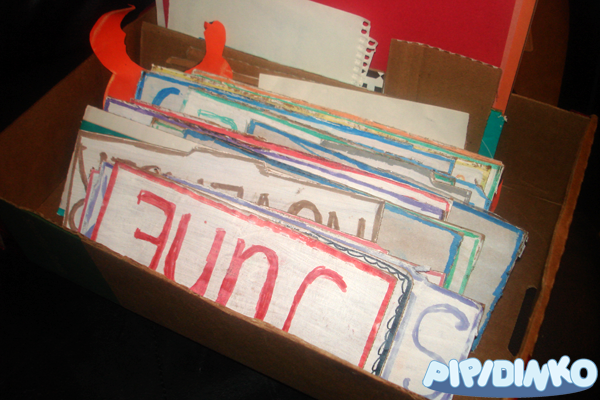 Today I see as a perfect opportunity to show another cardboard thing I made. 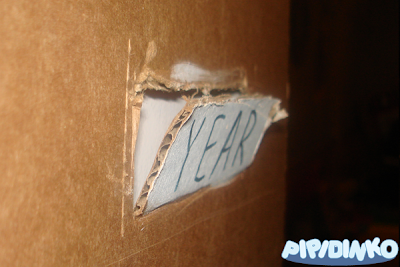 Here is the cardboard calendar. 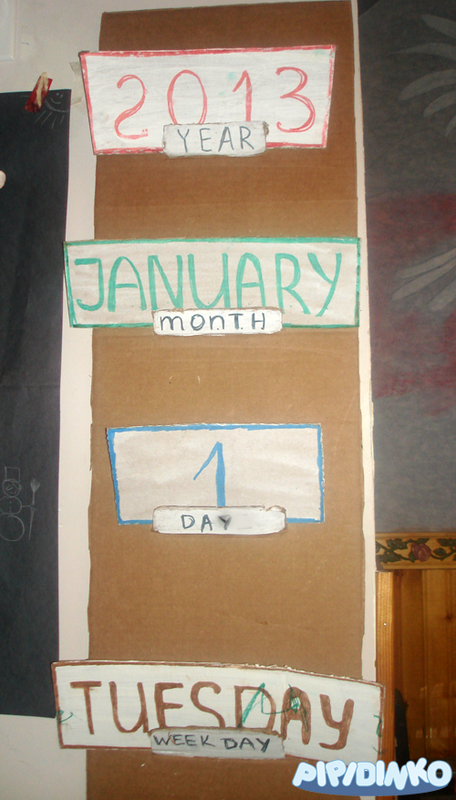 I attached a piece of cardboard to the wall, and made 4 slots to put the calendar items. I basically just cut 4 rectangular areas from the board, deep enough to be able to hold the boards. I actually made this one quite a while ago. I've designed and placed this calendar within Santino's reach, so that he would be able to change the dates and weekdays himself. We were pretty good changing the weekdays for a while, but then stopped for a few months, as Santino was in the rejection stage (is there such a stage? ), and was destroying everything, including this calendar. He would not tolerate the view of these boards, would start throwing them everywhere, or simply hiding them under the couch, or behind the book shelf. I decided to put this activity away for a while, and today finally took it out again. Changing the dates and weekdays helped Santino learn their names. He often called them all Tuesdays, I think he likes this word the most.